Goldlox's Greatest Hits is our new monthly wrap up feature. We'll recap our favorite book we've read this month and show you some of our favorite posts that you might have missed, as well as what's coming up next on Goldilox and the Three Weres. In Read This F-ing Book we featured YA vampires in The Jessica Series by Beth Fantaskey, kinder, gentler vampires in Molly Harper's Jane Jameson series, and one of our all-time faves: Stacia Kane's Downside Ghosts. We're all excited about Jennifer Estep's new YA series Black Blade! The first book, Cold Burn of Magic came out this week. Read an excerpt, check out Rose Red's review and enter the giveaway! Earlier this week, we talked about The Best Series Ever . . . That We Haven't Read Yet. Share yours with us and enter to win a copy of The Witch With No Name. If you weren't following the DABWAHA tournament you might have missed some awesome blog posts from Ilona Andrews. The final round of voting pitted Magic Breaks against Burn for Me. My favorite post featured Kate and Curran trading trash talk with Nevada and Rogan. I laughed until I cried! While you're there check out Kate and Curran's Twitter conversations. The Veil is one of my most anticipated books of the year. It's not out until August but Chloe Neill posted the first chapter on her website. May is Alpha Showdown time over at Vampire Book Club so you might notice us talking about a few particular Master Vampires a lot more than usual. And there might be another giveaway tomorrow. We're all about free stuff this week. 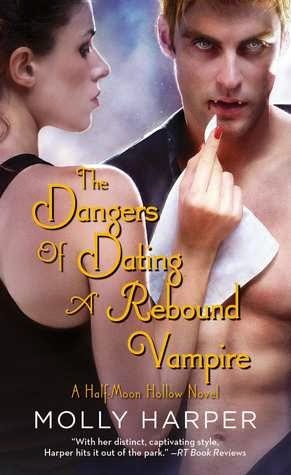 Review: The Dangers of Dating a Rebound Vampire takes place about six months after the novella I'm Dreaming of an Undead Christmas. Gigi's home for summer vacation and starting her job at the Vampire Council headquarters. On her first day of work, she's accosted in the parking lot by the same mysterious vampire who kissed her over winter break and disappeared without a word. The good news is now she knows she didn't imagine the golden-eyed stranger who may have been stalking her. The bad news is he has no memory of the kiss or the attack. So in her free time, Gigi tries to find out what's wrong with the man she's been obsessing over for months. I absolutely loved Gigi! She is the master of the pop culture reference. Harper did a great job giving her a distinct voice from the other heroines in the series. I also liked seeing her interact with the other programmers on her team who finally let her be an adult, unlike her overprotective sister and brother in law. I just loved her little gang of geeks and I hope they show up again in the series. And I liked getting to see more of the inner workings of the Council and some behind the scenes parts of their offices. We are working in a version of Oz with no full-frontal Christopher Meloni but better AV equipment. However, I did wish that the romance had a little more time to develop. Nik and Gigi had instant chemistry and a mutual infatuation. In fact, I think this book is a little bit steamier than previous ones in the series. But I didn't totally buy it when she declared her love for him, especially given everything else that was happening. It's hard to explain the other thing that bothered me without being spoilery. There are a few different people responsible for Gigi's troubles and while all the culprits are revealed, they're not all punished. And I'm not sure how well the punishments fit the crimes. Some of them may be addressed later in the series, so I'm trying to reserve judgment a little bit. It's not absolutely necessary, but I would recommend reading the prequel novella I'm Dreaming of an Undead Christmas before starting this book. I feel like I had a better sense of Gigi's emotions and her interest in Nik because of it. And really, I would read the other two novels first as well. Harper does a good job of recapping the previous books, but each new couple gets added to Jane Jameson's gang as the series progresses and I would hate not knowing the whole story of how they got there. 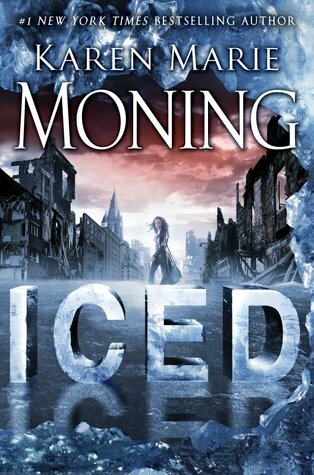 I'm really enjoying this series so I'm excited that there's at least one more novella and one more novel on the way. While I'm waiting, I'm going to have to finally check out those naked werewolves.